One of the most common issues facing authors, Indies in particular, is getting reviews. How do you match your work with potentials readers who enjoy reviewing? This can be harder than me successfully reading a map (don’t ask), especially if you write in a relatively obscure genre. 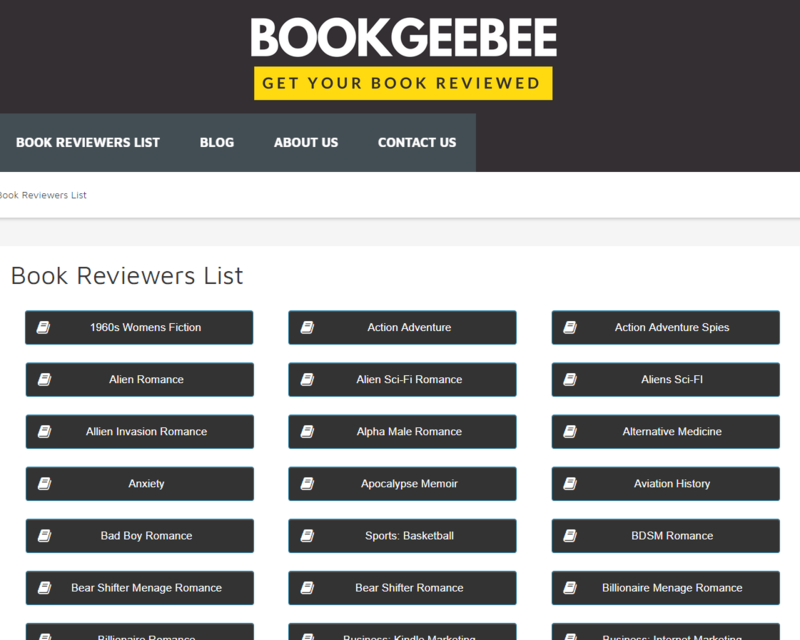 Enter BookGeeBee, an amazingly inclusive resource for reaching hundreds of potential reviewers. These are categorized by genre/subgenre, making the whole chore of getting reviewers a breeze. Genres — a total of 186 of them — include anything from Dragon Shapeshifting Romance (!) to Recipes: Lemon. Even better, it’s free to peruse. If you don’t wish to copy everything by hand (since Copy/Paste isn’t allowed on the site), you can download the lists in Excel format for a mere 99c per genre. For some information on their policies, check out BookGeeBee’s tips on the subject, and thanks to Sebastian White for the tip. My author/promoter friend, N.N. Light, cautioned me that, in her view, BookGeeBee is a scam website, as it has a low scamadviser rating. It also looks like some lists are completely empty, while others are pulling reviewers from only two books (for instance, the contemporary romance is grabbed one from just one of Nora Roberts’ books). Now, before posting here, I’d already seen the scamadviser warning. However, upon further digging, I also found the original thread on the Kindle forums where BookGeeBee was announced, and read the back-and-forth where its owner answered questions (and accusations). I then went ahead and bought 2 lists, which look genuine to me. The children’s books list, in particular, has 473 emails, pulled from reviews of 74 books. Only then did I decide it was an OK site after all and recommended it here. However, as always, you’re advised to exercise caution and common sense when buying off the Internet. Obviously, the quality of all lists is not the same. Since you can see in advance the list of reviewers for your chosen genre, be sure to confirm that your list is worth your time before parting with your money. Many thanks to N.N. for looking after us! Now that you’ve tested the water, I think you’re going to need a follow up post. Lol – you’re too kind. BookGeeBee costs just 99c per genre list, but I have no idea how many of the reviewers it has will actually respond positively to your request. If you try it out, do let me know. For more reviews, you may also want to visit authorsxp.com. Amy is offering a nice service where she matches readers to your books. I think it costs $25 (or something similar). The reviewers don’t get paid, mind you; they just receive an ARC copy. I86 genres! I never knew there were so many. I’m going to search for ‘Ex-Paramedic dog-walking’ right away! Thanks as always for the valuable tips. You are almost certainly correct in your assumption, Nicholas. Thanks for the update, Nicholas! Yes, we all have to be cautious (online and in real life, too) and I’m more than happy to help a fellow author out. 🙂 I’m glad you found a good list of reviewers for children’s books.